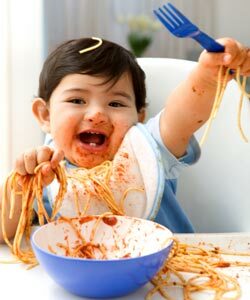 Meal time can be an adventure if you have a infant/toddler learning to eat solid foods. It can get very messy! Avoid leaving your child unattended (to throw sweet potatoes across the kitchen) to grab a dish cloth by using a highchair organizers. It is a great way to be organized and have everything you need at your fingertips during mealtime. A year ago, I created a video showing you the DIY way to organize a high chair. Now, thanks to Highchair Organizer, LLC, there are two adorable and attractive organizers to add style to your child’s highchair. The organizers attach easily to most manufacturer’s highchairs or booster seats in 10 seconds, they fold easily so you can grab them and go, and include multiple compartments to hold pacifiers, diapers, wipes, sippy cups, bottles and much more. They are easy to clean using a damp cloth and mild soap. What a dream! Take a peek at the Highchair Organizer website to learn more. Simplify your life by picking up a highchair organizer! The Highchair Organizer retails for $24.95 plus $5.95 s/h. What is your favorite product to simplify life with baby?